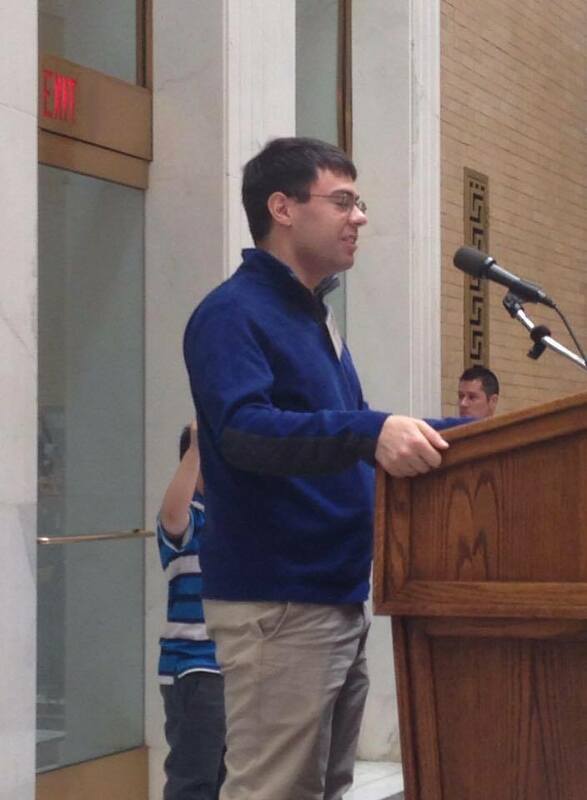 On Thursday, I did speeches to commemorate Autism Awareness Day. The first speech was at the State House on Thursday morning. I was there to comment on housing and transportation for people with autism, as well as read two of my poems. Later on in the day, I performed a speech at UMass Lowell for their annual “Disable the Label” event. For that event, I recited the same two poems that I shared earlier in the day. I began the day of April 2 at the State House in Boston. I was there as one of the primary speakers for Autism Awareness and Acceptance Day, which focused on the theme of “Housing Options for Individuals with Autism.” The other speakers that day were Governor Charlie Baker, Deborah Flaschen (founder and president of 3LPlace, a residential home for people with developmental disabilities), Nat Batchelder, a young man with fairly severe autism and son of Brookline autism activist Susan Senator, and Senator Harriette Chandler, who accepted an award on behalf of Senate Majority Leader Stan Rosenberg, who was unable to attend the ceremony. The emcee of the event was Randy Price, an anchorman with WCVB 5 and veteran of the Boston journalism business. I gave my speech at around 10:45 AM. I came on after Nat Batchelder, who is 25 years old and has fairly severe autism and gave his speech about housing with the help of his caregiver, John Excellent. I was introduced by Randy Price, who mentioned that I had graduated from college and have interests in dogs, music, reading, poetry, and several other areas. During my speech, I talked about how there is a lack of accessible transportation near my home in Billerica and that it makes difficult to see friends of mine. I also mentioned about the unsuccessful processes of submitting applications for the MBTA Ride program, the Lowell Transit Authority system, and the reduced fare program for the MBTA Charlie Card. Having the right transportation methods can be extremely beneficial for future employment opportunities and to gain more social connections. I then began to comment on my current housing situation as a young adult with high-functioning autism. I reflected on how living with my parents during my lifetime has helped master many of the household chores that I do at home and how these skills could be very useful for when I do live independently someday with a friend. I admitted that I do not have as many social connections as I would like to have, but am continuing to work with my AANE LifeMap Coach Orlando Torres to help get more social connections and continue to look for more job opportunities in the area. I have tried to find the appropriate social group for me, but while many of the social groups that I have joined have been useful to me, I have been unable to determine which social group will be most beneficial in the long run. I concluded the event by reciting two of my poems, which were “Acceptance of Autism” and “Spring Awakening.” I told the audience that my poems have received positive reception from local Boston media personalities and several musicians. I ended the day by giving another talk about Autism Acceptance Day at UMass Lowell called “Disable the Label”. I had been invited to be a speaker for this event by Professor Ashleigh Hillier, who teaches courses on autism and has been a friend of mine for 8 years. When I gave my speech, I was introduced by Dr. Hillier’s colleague, Professor Jody Goldstein, who I had communicated via email before the event and had met before the speeches of the event had started. My speech consisted of the two poems that I discussed at the State House event, “Acceptance of Autism” and “Spring Awakening.” The event ended with the UMass Lowell Choir singing the theme song for Autism Awareness Day named “Light It Up Blue,” as the building across us had lit up their facility with the color blue to symbolize Autism Awareness and Acceptance. It was a wonderful close for the day that celebrates the achievements of autistic people.